I figured if I was going to wear a top covered in little bunnies, why the hell not pair it with playful polka dots? After throwing them together on a whim, I actually really liked the way the navy and burgundy and small-scale prints played off each other. I've really loved your outfits the past few days! I have quite a few similar tight skirts and never wear them because I don't want to look inappropriate. Your outfits show that they can be worn and still look adorable! too cute! love both patterns- and I'm liking how this brings out the vibrance in your hair color too! I love your hair like it is here...so cute!! & I love the bunny print as well. Oh I love, love, love these pictures! 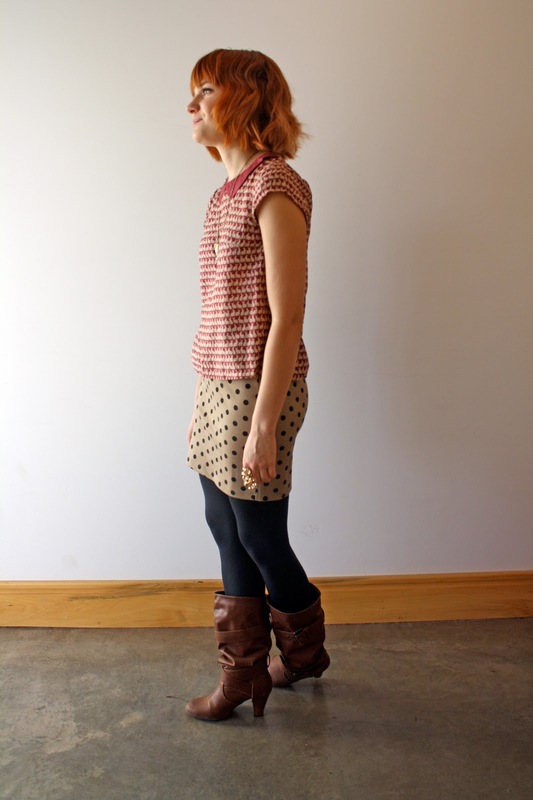 The pattern mixing is fabulous and your hair looks gorgeous! Neat idea!! I almost bought that top from H&M the other day. Kind of kicking myself I didn't just buy it since you made it look so darn cute. The two small prints are really quirky and cool together. I would have never thought of pairing these. The colors definitely work! I've been so into print mixing lately so I'm really feeling this.